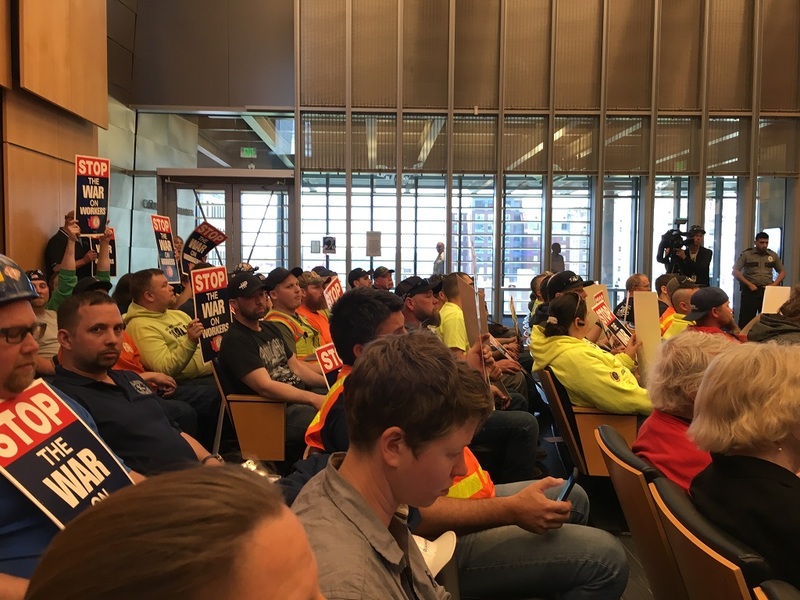 Despite various factions in the city lining up either for or against the proposed “head tax” on large businesses in Seattle, the City Council rolled up its sleeves today and got back to work debating the nuts and bolts of the proposal. Their goal is to finish it up on Friday and pass it into law next Monday. The Council members spent two hours this morning and another two this afternoon picking up where they left off in walking through two memos prepared by their staff. Those memos flagged a number of issues with the legislation — both the tax itself and the spending plan. 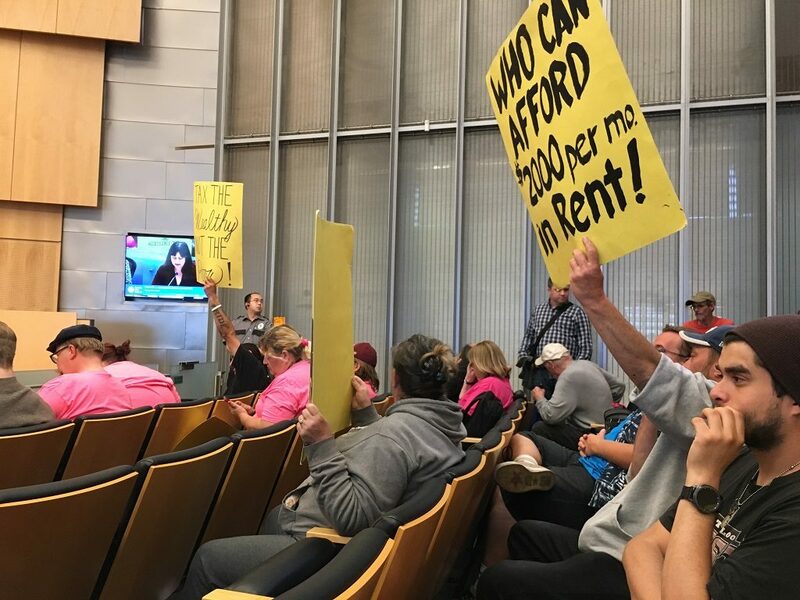 Affordable-housing and homeless activists held a rally outside City Hall this morning and showed up in force for the public comment session in this morning’s meeting to voice their support for the tax. Construction workers held a rally this afternoon and sat through the afternoon meeting wearing their safety vests to register their opposition. In the meantime, Mayor Jenny Durkan spoke to reporters after a speech today and let it be known that she opposed the tax proposal as currently defined, but was working behind the scenes to negotiate a compromise. A “sunset” date for the tax. Rather than enact a tax that would run in perpetuity until repealed, some Council members suggested thinking of it more like a fixed-term levy that required an “affirmative renewal” after a certain number of years. A thorough evaluation, including the economic impacts. Tied very closely to the renewal decision would be ongoing evaluation of the impacts of the tax legislation: both the impact on the homelessness crisis resulting from spending the tax revenues, and the economic impact of imposing the tax on the local economy and employment. Mayor Durkan specifically raised the notion of including an economist among the people commissioned by the city to perform the ongoing evaluation so that the economic impacts can be considered. This afternoon, Council member Mosqueda agreed with that notion but also pointed out that getting homeless people off the street may also serve as an economic stimulus for Seattle’s businesses. An oversight committee. Durkan and several City Council members felt strongly that there ought to be an independent oversight committee, modeled on the Seattle Housing Levy and Seattle Parks Levy oversight boards, to guide the spending plan and track the ongoing evaluations. Such an oversight committee would be staffed with people without connections to the service provider organizations that would be potential recipients of the head tax revenues. An early thought has been that the Housing Levy committee’s charter could be expanded to take this on, since most of the funding will go toward building affordable housing; however, the imperative for the oversight committee stems more from skepticism in the Human Services Division’s ability to execute successfully on the emergency homeless response, and the current Housing Levy oversight committee doesn’t have the right expertise to guide that work. Most likely, the legislation would require the city to study the issue and provide a recommendation back to the Council when it delivers its implementation plan. Increasing immediate spending on the emergency homeless response, given the time it takes to build new affordable housing after funding becomes available. That immediate spending might look at temporary housing options that could be built quickly such as tiny houses, in addition to sanctioned encampments, basic and enhanced shelter, and options for people living in vehicles. Providing immediate housing for homeless people who are making less than 30% of Annual Median Income (AMI), though some combination of rental, operating, and capital subsidy programs. Again, this would be a short-term measure while Permanent Supportive Housing units are built over the next 2-3 years. Increasing sanitation services. The city has $300,000 budgeted in 2018 for the Encampment Trash Pilot (ETP) program as part of the Clean City Program. The proposed head tax spending program would allocate an additional $9 million for sanitation services over five years, but the Council may decide to add more. Last year, the city spent $200,000 on ETP and collected 238,640 pounds of garbage from encampment sites. Increasing public health services. The currently proposed spending plan already includes just over $5 million for a new mobile health van, but the Council is looking at almost $10 million of other opportunities to address public health issues within the homeless community. Those opportunities include responding to communicable disease outbreaks, mental health services, women’s reproductive health services, a nurse to accompany outreach to unsheltered homeless persons, and a nurse embedded in a shelter program. Increasing standalone hygiene services. A sore point continues to be that the Human Services Department has chosen to emphasize offering hygiene services within shelters and other programs and de-emphasize them as standalone services. The Council is looking at options for expanding funding for standalone services, including a mobile shower/restroom trailer, a mobile laundry trailer, and portable toilets and hand washing stations. It should be noted that these investments also contribute to addressing public health concerns. Exempting some healthcare and for-profit medical research organizations from the tax. One local healthcare provider, The Polyclinic, asked for this since it claims to already provide substantial free and subsidized healthcare services to low-income individuals and families in Seattle despite not being a registered 501(c)(3) nonprofit. But as Council member Sawant pointed out, there are many healthcare providers that are part of the problem, using exploitative practices to wring profits out of the country’s broken healthcare system. A blanket exemption for for-profit healthcare institutions (registered nonprofits are already exempted under the current proposal) would not be a good outcome. Yet it was unclear how to draw a distinction between the “good guys” and the “bad guys” that could be codified in a tax law. Beefing up the Navigation Team. The “Nav Team” is the front line for outreach to unsanctioned homeless encampments as well as the group that prioritizes, schedules and executes on cleanups of those encampments. As more housing and services become available it makes sense to increase the Navigation Teams’ ability to reach out and offer those resources to homeless people, but Sawant felt strongly that none of the revenues from the head tax should go towards increasing the “sweeps” of unsanctioned homeless encampments. It was unclear whether other Council members agreed with her. Reducing the size of the tax per employee. While there was wide agreement that $75 million was a reasonable annual revenue target for the tax, some Council members — notably Harrell and Juarez — believed that raising it by charging the top 3% of businesses $500 per full-time employee was simply too much. Harrell wanted to look for other revenue sources at the state level — or potentially to reduce appropriations for other line-items in the City’s budget — in order to reduce that number. Finally, Gonzalez noted that the issue of using a employee-hours tax versus a payroll tax has continued to raise concerns. Early feedback was that businesses felt that a payroll tax would be more equitable and less burdensome on small businesses that are more dependent on low-wage workers. But Gonzalez said this afternoon that she has heard from other companies that a payroll tax would be too burdensome on them. She suggested that she might bring forward an amendment that drops the payroll tax and keeps it as an employee-hours tax throughout its duration, so that the Council can debate and decide which approach it prefers. The Council reconvenes Friday morning at 9:30 to begin considering amendments, and if all goes according to its plan, it is likely to vote the bill out of committee in that meeting. That would set it up for final passage as soon as next Monday, if the Council members feel comfortable that they have addressed all the remaining issues by then (though it would almost certainly see a few last-minute amendments on Monday afternoon before the final vote). Between now and Friday morning, the Council members and their staff will be madly drafting, circulating and reviewing amendments. With so many issues under consideration, and active negotiation underway with the Mayor’s Office, it’s unclear whether it will all come together by Friday. With five “yes” votes, the Council doesn’t have a veto-proof majority, so the bill’s sponsors need to either find a compromise with Mayor Durkan or bring one or two more of their fence-straddling colleagues on board. It was good to see that for the most part the Council members put acrimony aside today and rediscovered their ability to communicate their priorities and concerns openly in a spirit of cooperation and compromise. It was a big change from the tone set last week. We’ll know more on the fate of the head tax on Friday morning. and the general business community. Sccinsight, I admire your faith in the system. Thank you. I didn’t say I thought it was a good idea. (I also didn’t say I thought it was a bad one) And if I had faith in the system, I wouldn’t spend so much time digging around in the details to try to understand what it’s doing. I’m just trying to report on what happened today, and what’s going to happen between now and Monday. I will say this though: there are no perfect answers. The city has very few legal options for raising revenues, especially progressive ones. The whole thing is a huge mess, and the Council and Mayor are going to take a lot of heat no matter what they do. Time to start fresh with the idea to create revenues to help with the homeless issue. Head Tax is a job killer and a disaster waiting to unravel. The Task Force which was created to come up with this Head Tax was a very bad idea. If Mayor Durkan wants Business to buy in, bring them to the table at the beginning. The City Council is off the rails, they are obstructing progress currently. Sorry, I did not mean to demean your work, and realize this is going to more money to get housing and homelessness under control.There seems to be 2 or 3 recent reports on the subject. Might you consider doing a compare contrast? I will try to get to it. I’ve got a backlog of reports to read at the moment.